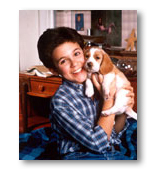 In the series, Fred Savage plays the main character Kevin Arnold. On the 7th of August 2004 he married his "sandbox-love" Jennifer Stone. On the 6th of August 2006 his wive gave birth to their first child – it's a boy. At the moment, Fred works for the US-TV-station Nickelodeon as a presenter. Kevin Arnold plays the main character in "The Wonder Years". He's a totally normal teenager, coping with the everyday-problems of an adolescent. His best friend is Paul Pfeiffer – they know each other for a lifetime and together they nearly went throught every high and low of a friendship. Kevin's long-time girlfriend is Winnie Cooper, who lives in the same street he does. But their friendship is tested over and over again. • Fred had his first kiss together with Danica McKellar (Winnie) in the first episode of "The Wonder Years"